In Pennsylvania, New Jersey and New York, Site Specific now offers SeptiTech systems as affordable and sustainable wastewater treatment products for properties not hooked up to a public sewering system. 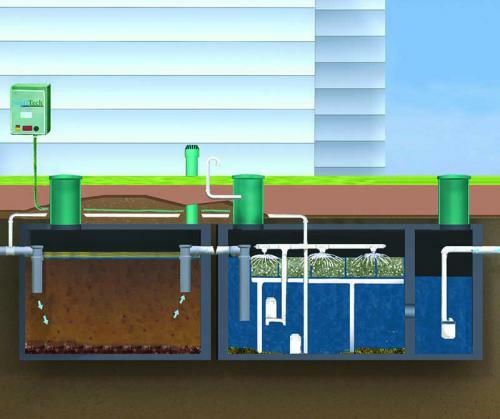 These systems help ensure a clean environment and opportunities for water reuse. Offering simple, low-cost and robust treatment solutions, the SeptiTech® STAAR™ Filter System is a low-energy treatment option using anaerobic-aerobic sequence (AAS) bioreactors. The primary anaerobic pre-treatment tank settles, clarifies and manages the sludge return, then followed by a secondary aerobic treatment process. The residential and commercial model versions are environment-friendly, regulatory-approved and preferred for private, business, and government applications. With exceedingly stringent Nitrogen Removal standards, these Advanced Wastewater Treatment Systems (AWTS) utilize an award-winning Trickling Filter Technology and gave successful tracks record from 100 gpd – 150,000+ gpd. STAAR filter systems from SeptiTech are designed for a simple, automatic and reliable equalization and clarification process to treat high organic loads. The biological trickling filter maintains low levels of nitrate-N with all below-grade components that fit in concrete, plastic or fiberglass tanks. SeptiTech® STAAR™ systems are routinely specified for homes, communities, housing developments, hotels, resorts, schools, shopping centers, restaurants and nursing homes. With a smart and completely automated process, the PLC customizes treatment, monitors pumps, floats, alarms and collects operating data. SeptiTech utilizes an enhanced, unsaturated, self-cleaning media and processor for its trickling filter technology. This anaerobic-aerobic sequence uses less energy than ATUs and is superior to other anaerobic-type systems, making it ideal for remote and seasonal applications. Automatic return pump removes the sludge from the trickling filter Aerobic Treatment Zone, thus all the sludge management is in the Primary Settling Zone.